Our spring woods would be a lot quieter today if not for a North Carolina conservationist who was devoted to wild turkeys. This was a while ago. R. Wayne Bailey was already slowing down, but he was still in the woods most days in the spring, 83 years old, and much of that lifetime spent in a line of work that’s not easy on the knees. We started off in a small holler in the folded Piedmont countryside, near his home in tiny Milton, hard by the Virginia line. The eastern sky was washed with pink and orange. The woods were in their full spring glory. I stayed a step or two behind, ready to steady his gait or press a barbed-wire fence down with my boot. We topped a rolling ridge just as the rising sun crested the horizon, and I could see the vernal waves of the land below us. Bailey leaned over to whisper: “Let’s see if we can wake one up.” He took out an ancient box call and began to play. From two different directions, two wild turkey toms gobbled back. My heart thumped. Bailey called again, sending a plaintive yelp across the rolling Caswell County ridgetops. A third turkey thundered a faraway challenge. I shook my head and sighed. I couldn’t help but smile a bit. After the life he’d lived. After all he’d accomplished. After the way he’d changed the spring woods of North Carolina. Thought we’d hear something by now. What an ironic line, because Bailey’s legacy is the fact that the spring woods of North Carolina sound nothing like they used to. When I hunted with Bailey, he’d long since retired from the NC Wildlife Resources Commission. He’d worked there for years as a wild turkey biologist after heading up West Virginia’s wild turkey program. When he started his career in 1945, the sight of a wild turkey — even the sound of a distant gobbler — was a rare, if not totally absent, aspect of the spring woods across most of the South. In 1970, there were only about 2,000 wild turkeys in all of North Carolina. Bailey helped pioneer many of the methods of trapping and transplanting wild turkeys to restore populations. He captured his first live turkey with a homemade net he’d cobbled together with plumbing pipe, which he dropped from the ceiling of a state park picnic shelter. He soon moved on to cannon nets and rocket nets. He helped move hundreds of wild turkeys from their few North Carolina strongholds, such as the Roanoke River bottomlands, to woods that hadn’t known a gobble in decades. But it was worth the mess. 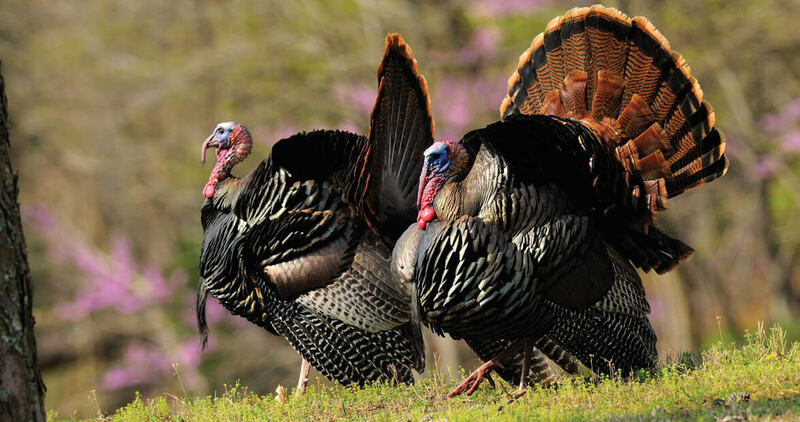 In 2015, North Carolina’s wild turkey population stood at 265,000. Today, there are birds in every county. In April and May you can rise at dark-thirty, find yourself in a quiet Carolina forest, and very likely hear that guttural, unmistakable, otherworldly sound — the gobble of a wild tom turkey, looking for love. Another spring morning, another North Carolina farm, 11 years after my morning with Bailey, eight years after he’d passed away. My son, Jack, and I share a tree trunk in Nash County, backs pressed against the rough bark, still as marble. Behind us is a broad field, and we look into an open flat of hardwoods and pines, the young leaves of the maples and oaks still that tender young green color that is as ephemeral as autumn’s reds and golds. The earth smells rich and loamy, pregnant with all the life about to spring from the dirt. My buddy Josh Pelletier is 20 feet behind us, softly yelping with a mouth call. It doesn’t take much. The real tom turkey is on fire, gobbling every 15 seconds as he makes his way up the hill. Each gobble seems to grab my heart and shake it like a man shaking grapes off a vine. No wonder Wayne Bailey never got over this. There is nothing on earth like a wild turkey. They can see your eyeballs move. They can hear you think. If a turkey could smell, the old saying goes, there’d be no such thing as a turkey sandwich. You look and look and look for a turkey, and you hear him coming, putting and spitting, and you know he must be close, but this is a spirit-animal you seek in the spring, a physical being most of the time but maybe not always. You look and you look and then you blink, and where before there was an opening in the woods and a shaft of sunlight and only the hope of a turkey, there he is and here he comes, as if he has risen from the soil. You can hear your heartbeat, loud enough to wake the sleeping. In 1975, when I was 14 years old, I placed third in the youth division of the North Carolina wild turkey calling championships. I was one proud soldier, and absolutely grateful that there were only three kids in the competition. 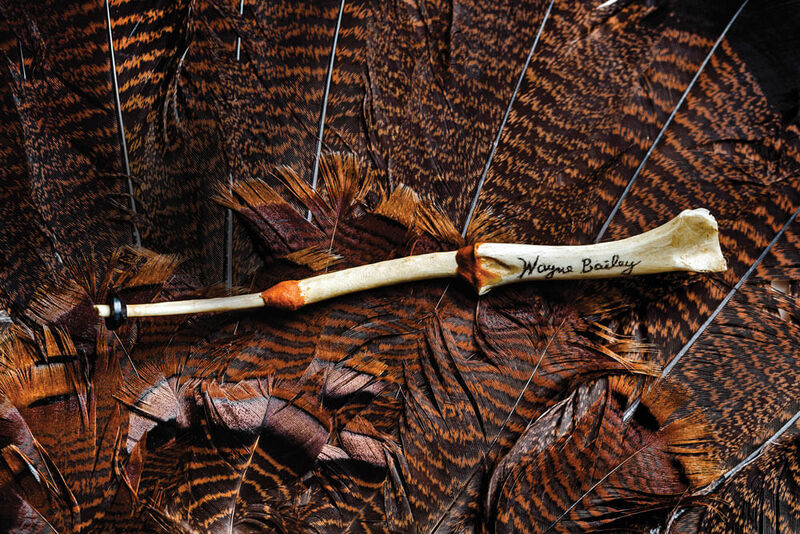 I won a little plastic trophy with a fake bronze turkey on top, and a wingbone call, an old-school turkey call fashioned from three turkey wing bones. I’d never seen one before. It was made by some supposedly famous guy I’d never heard of: R. Wayne Bailey. This is the time of year when the old man most often comes to mind, in early spring, during those fleeting few weeks when the countryside seems to exist in a state of suspended animation. It doesn’t last long. For maybe two weeks, the foliage so electric green it almost hurts your eyes to look at it, but you still need a fleece jacket at dawn before you strip to short sleeves after breakfast. These are the mornings I remember R. Wayne Bailey, up on that Caswell County hill, head cocked, fingers stroking a gruff, short beard, listening for the birds he’d poured his life into bringing home. He’s out there still, and ever will be, every spring, in every corner of Carolina, when the sun cracks the green horizon and the thunder chickens roar.